1961, the West Village, New York. Singer-songwriter Llewyn Davis (Oscar Isaac) skulks at the fringe of the folk-revival scene, bothered by the memory of his dead partner, and hoping for a big break to land in his lap. Meanwhile, the unwelcome pregnancy of a brief liaison with Jean (Carey Mulligan) and the accidental adoption of a cat, create a series of mishaps that lamentably fail to alter anything about Llewyn’s life. 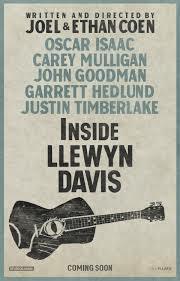 Inspired by the memoir of real-life folk hero, Dave Van Ronk, Inside Llewyn Davis is one of the Coen brothers’ serious films. While the film is quirky and darkly comic, primarily via Llewyn’s expressions to the absurd people and circumstances around him, the film is based upon an unsexy musical scene and infused with melancholy. Additionally, its hero is not likeable. For example, he tries to borrow money from a friend (played by Justin Timberlake) for an abortion when the friend is the boyfriend of the said girl. He laments the suicide of his partner in their flourishing musical duo, but he’s the one left suffering, right? He’s a man who doesn’t deign to connect with others, yet he can’t function alone. He takes responsibility for the ginger Tom, but he alienates everyone around him, even long time fans. That said, Llewyn is captivating. His observation of the absurd injustices in the world around him, is as relevant today as is was then.